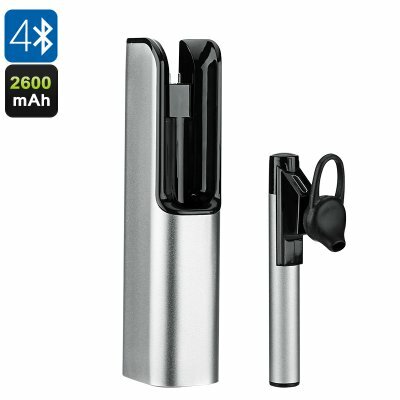 Successfully Added Wireless Bluetooth Headset - Noise Cancellation, Built-in Mic, Hands Free Phone Calls, 2600mAh Power Bank, 10m Range (Gray) to your Shopping Cart. With this portable Bluetooth headset, you’ll always be able to listen to music on the go and engage in hands-free phone calls no matter where you’re at. With its comfortable ear-hook styled ear-buds, this headset forms a guarantee fit to anybody out there. Its light weight and stylish design allows you to wear it at any time and on any occasion. Whether you’re in the car, at school, or taking out the dog for a walk – these wireless headphones will always provide you with audiophile-grade music quality. Simply sync it with your smartphone, tablet, or laptop – and you’ll be all set to enjoy all those favorite tracks from your music library. Besides allowing you to enjoy those all-time classics on the go, this wireless headset furthermore features a built-in mic thanks to which it lets you engage in hands-free phone calls. By providing you with the option to answer or reject phone calls, these Bluetooth earphones efficiently let you call to your friends and family back home while you’re on the move. Packing a tiny yet powerful 45mAh battery, it delivers up to 5 hours of continuous usage time. From now on you’ll be able to head out with confidence as this Bluetooth headset allows you to get through the toughest of days – letting you enjoy all your music and engage in countless hands-free phone calls. What really sets this Bluetooth headset apart is that it comes with its own miniature portable power bank. Featuring an epic 2600mAh battery, this power bank allows you to charge your Bluetooth headset countless times while on the move – ensuring that you’ll never have to worry about running out of juice. Thanks to the compact design of both the headset and power bank, this accessory is highly portable and can be carried around wherever you go. Its 10m Bluetooth coverage furthermore brings along great mobility, allowing you to walk around while listening to music or engaging in hands-free phone calls without disturbing the audio quality. This wireless Bluetooth headset comes with a 12 months warranty, brought to you by the leader in electronic devices as well as wholesale electronic gadgets..
Arabic: - سماعة بلوتوث - Chinese Simplified: - 蓝牙耳机 - Czech: - Bluetooth sluchátka - Danish: - Bluetooth headset - Dutch: - Bluetooth-headset - French: - Oreillette/headset Bluetooth - German: - Bluetooth Headset - Hebrew: - אוזניית Bluetooth - Hindi: - ब्लूटूथ हेडसेट - Italian: - Auricolare Bluetooth - Japanese: - ブルートゥース ・ ヘッドセット - Korean: - 블루투스 헤드셋 - Malay: - Set kepala Bluetooth - Norwegian Bokmål: - Bluetooth hodetelefonen - Romanian: - Setul cu cască Bluetooth - Russian: - Bluetooth-гарнитура - Spanish: - Auricular Bluetooth - Thai: - ชุดหูฟังบลูทูธ - Turkish: - Bluetooth kulaklık - Vietnamese: - Tai nghe Bluetooth.